The government has adopted new airports as the focal point for the development of aviation infrastructure, with the ministry of civil aviation aggressively pushing for the development of the Navi Mumbai and Hindon airports in Mumbai and Delhi. 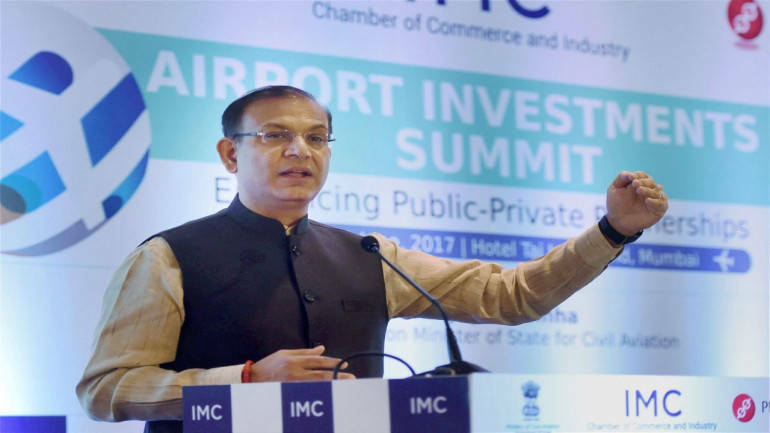 Speaking at the CAPA Aviation Summit, minister of state, Jayant Sinha said that the government is “putting efforts” to decongest metro airports in order to support the current capacity while building new airports. “Work is on at war footing to set up new infrastructure around metro airports,” he said. According to the MoS, work for development of additional runways at Delhi and Bangalore airport are in full swing coupled with fast tracked development of Navi Mumbai, Jewar International airport and Hindon Airport. While the government hopes to start Navi Mumbai airport by 2021-22, Hindon airport is expected to start operations by next month. Hindon airport in Delhi was an air-force base, which has been partially taken over by the ministry for civil operations. According to senior ministry officials, the defence ministry has given permission to carry out civil operation at the airport by assigning different entry and exit route from the base. “They have protected their core operational area and have given access to the base in order to provide ready infrastructure to carry out flying operations by airlines… We will develop our own infrastructure simultaneously,” a senior official has said. Due to unavailability of slots at Delhi’s Indira Gandhi International Airport, the government had decided to start the operations at Hindon airport, till new runway is built at the Delhi IGI in three to four years. Hindan was approved by the government under its regional connectivity scheme to provide connectivity to places like Pithoragarh, Jaisalmer, Gorakhpur, Prayagraj (Allahbad), Hubli and Kannur. Similarly, Delhi’s second international airport at Jewar is expected to be operational by 2022. The airport will support Delhi IGI airport to handle the growing passenger count every year. According to Sinha, the Jewar airport will be connected with IGI via metro. According to government estimates, close to 1.1 billion passengers will fly in, out and within India by 2040 which will require almost 200 airports. Presently, 187 million passengers have been recorded in India. "In leading regions like Delhi and Mumbai, even the second airports are likely to be saturated by 2040 and will require a third airport. Overall, India may require around 190-200 airports in 2040," Vision document for 2040, released by the government has noted. Sinha hopes to inaugurate Navi Mumbai airport by FY22, whose updated cost stands at Rs 16,704 crore. Situated on the outskirts of Mumbai, the Navi Mumbai airport is likely to handle 10 million passengers after the first phase of the airport is inaugurated and 60 million passengers overall. The airport is being developed under a public-private partnership (PPP) model between GVK Group subsidiary Mumbai International Airport (MIAL) and City and Industrial Development Corporation of Maharashtra Ltd (CIDCO).